About 35 miles northeast of Little Rock, Arkansas, at about 10:00 p.m. last Friday night, thousands of red-winged blackbirds began falling from the sky. They covered the earth, landing in backyards and on roofs, blanketing the roads. I would hope so! How freaky is that? Outside minding your own business on New Year’s Eve and it friggin’ starts raining blackbirds? No thank you! For now, state officials are speculating that the birds may have died as a result of stress, startled by fireworks in the area, or perhaps by lightning. But, Mr. Stephens acknowledged that the cause may never be known. A few days earlier, by the way, 83,000 fish died in the western part of Arkansas. Officials are saying the two incidents are not related, and believe the fish died of disease. The likelihood of a connection between dead fish in a river on one side of the state and dead birds from the sky in another is pretty much nil (nor is there any connection between these events and the yearlong swarm of mini-earthquakes in the center of the state). But it is all rather odd. Becky Short, who also sits on the City Council, said that in addition to the controversial fireworks theory, people have already begun joking about the biblical end times and U.F.O.’s. “Looks like some sort of phenomenon happened,” she said. 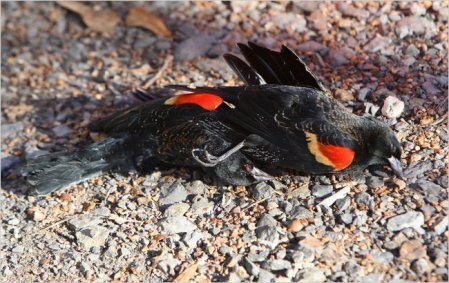 So let me get this straight – thousands of fish die, a bunch of earthquakes hit, and now 4,000 birds fall from the sky, and they think it’s just a crazy phenomenon? Sounds like the end of the world to me. Or at least the end of Arkansas. I’m a bit more concerned about the fish than I am the birds. “Eh the fish are just diseased.” Like that’s normal or something? 53 queries in 1.068 seconds.